Mish's Global Economic Trend Analysis: Japanese Style Deflation Coming? Where? Fed Falling Behind the Curve? Which Way? 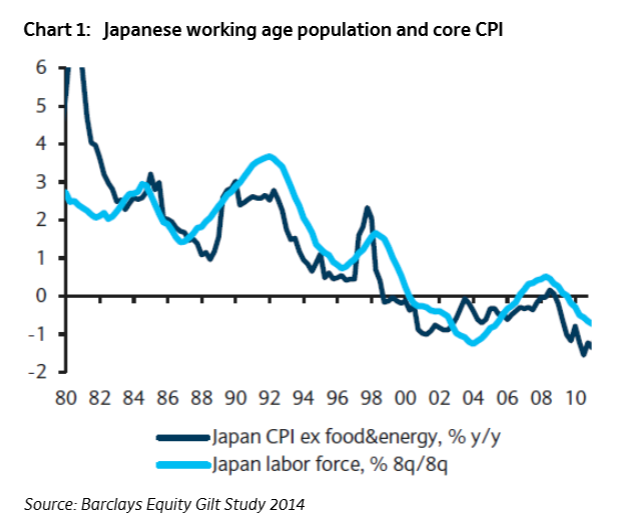 Japanese Style Deflation Coming? Where? Fed Falling Behind the Curve? Which Way? There's some interesting discussion points in the UK-based Absolute Return Partners October 2014 Letter, by Niels C. Jensen, most of which I agree with, others not. 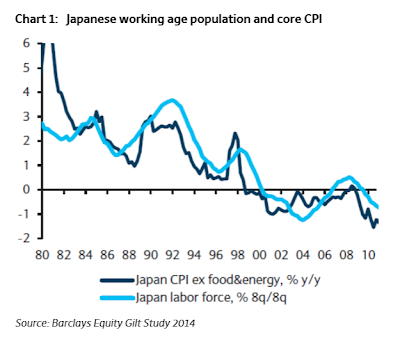 Japan-Style Deflation in Our Backyard? It is no secret that we have been long-standing believers in deflation being a more probable outcome of the 2008-09 crisis than high inflation. What has changed over the past six months is that the world has begun to move in different directions. Whereas rising unit labour costs in the U.S. make outright deflation in that country quite unlikely, the same cannot be said of the Eurozone. Japan-style deflation across the Eurozone is no longer an outrageous thought. As you can see from chart 1, there is a close link between CPI and demographics. That has certainly been the case in Japan and I don’t see any reasons why it should be any different in Europe. The negative demographic trends are perhaps not as acute in Europe as they were in Japan in the early to mid 1990s, so one might expect a less dramatic outcome here, but the writing is on the wall. Furthermore, Japan’s problems were multiplied due to an almost complete lack of political recognition and willingness to take drastic action. At least, with Mario Draghi in charge of the ECB, there seems to be a willingness to do something. Deflation and "Willingness To Do Something"
Jensen is mistaken about Japan's willingness to take action. Japan has a debt-to-GDP ratio of 250%, highest of any major developed country, as a direct consequence of fighting deflation. Japan piled on debt, built bridges to nowhere, and engaged in other wasteful spending, all of which made matters worse. Taking on debt to fight deflation is insane. Yet that is exactly what France and Italy want now! Japan's QE certainly did not help either. Both policies addicted Japan to 0% interest rates forever (until of course Japan blows up). To suggest that the ECB can do something meaningful with European demographics being what they are, the flaws in the euro being what they are, and lack of willingness for France and Italy to initiate badly-needed structural reforms, is simply wrong. Holding down interest rates and state-sponsored stimulus will have the identical result as in Japan. As for wages, they are actually rising not only in the US, but also in Europe as I pointed out in European Service Prices Plunge at Steepest Rate Since January 2010; Reflections on Keynesian Stupidity. In the US, the Fed did stave off for now, another round of price deflation. However, that came at the expense of creating monstrous asset bubbles. The bursting of asset bubbles is inherently deflationary, and much more damaging than falling prices because of the impact asset prices have on asset-based loans. I propose falling prices should be welcome across the board. Is the Fed Falling Behind the Curve? As mentioned earlier, the picture in the U.S. – and to a degree also in the UK - is quite different. 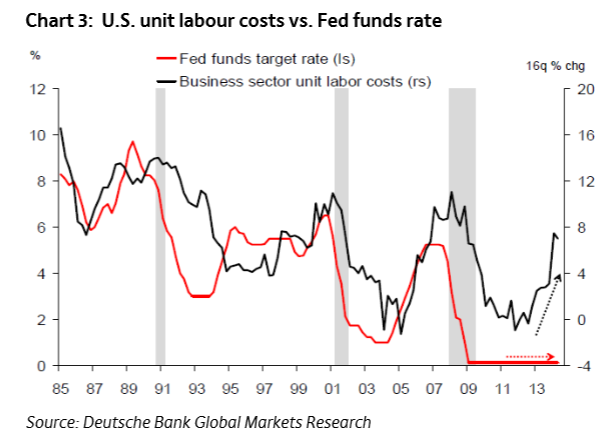 The Fed increasingly looks like it is behind the curve with the Fed Funds rate remaining unchanged despite a significant rise in unit labour costs. Not only does that suggest a meaningful rise in the U.S. policy rate over the next couple of years – and therefore also possibly a further rise in longer term rates - but it also suggests a relatively strong U.S. dollar. 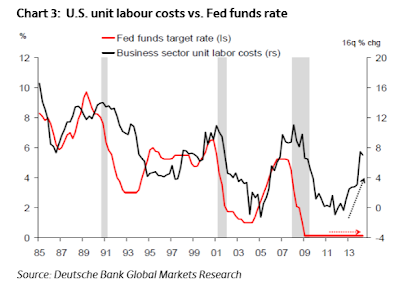 Forward rates on the Fed Funds rate suggest it will reach 1.50% by June of next year; however, if the latest estimates for unit labour costs are painting a true picture of inflation in the pipeline, one could argue that the Fed Funds rate could go substantially higher. Behind the Curve? Which Way? Curiously, St. Louis Fed Governor James Bullard says Fed Should Consider Delay in Ending QE because "Inflation expectations are declining in the U.S."
That's nonsense of course because of the asset bubbles the Fed spawned. With interest rates so low across the world, the chase for yield is on. Which Equity Markets Offer Most Potential? One area I have not elaborated on yet is Japan. There are strong indications that Japan has finally turned the corner economically. 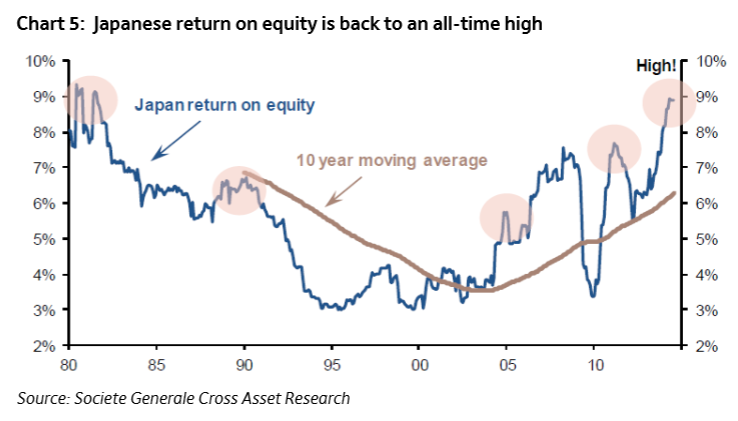 At the same time, return on equity has returned to pre-crisis levels in Japan, but valuations have not. With a more or less fully priced U.S. equity market and a Federal Reserve Bank at risk of falling seriously behind the curve, and a Europe where it is hard to see where growth is going to come from (ex. U.K.), Japan looks remarkably interesting, and I expect it to be one of the better performing mature equity markets over the next few years. Just don’t forget to hedge your currency risk. I am not saying that the Yen will fall, but there is enough uncertainty surrounding the Yen that I would rather not have to worry about that aspect. It's certainly debatable whether Japan has turned the corner economically. 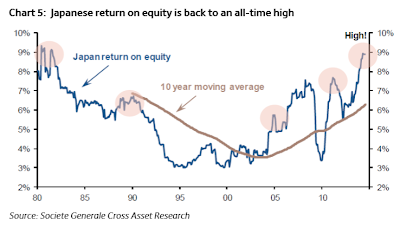 Nonetheless, on a valuation basis alone, I have been recommending a yen-hedged position in Japanese equities. Whether or not the Yen plunges will have to do with Abenomics, and how Japan eventually handles (or doesn't) zero percent rates. Jensen's comment that US equities are "more or less fully priced" is silly. US equities are priced well beyond perfection in one of the biggest valuation bubbles in history. Jensen concludes with an interesting chart and comments about piling on. 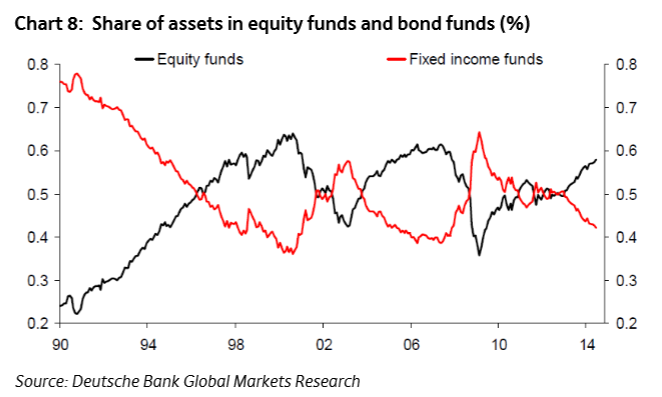 Investors (well, most investors) continue to pile in to equities, as if they are the solution to their return challenge. Pension funds are one example of such investors. If such pension funds have fixed obligations (called defined benefit plans in the UK), they currently struggle to generate the level of re turns they need to meet their obligations. Even if there are good reasons to believe that the prolonged rally can continue for a little longer, there are equally good reasons to believe that the current equity bull market may end in tears. Such is the disconnect between stock valuations and economic fundamentals in some markets. I agree with Jensen on Japanese equities, hedging the Yen, and the prospects of deflation in Europe. 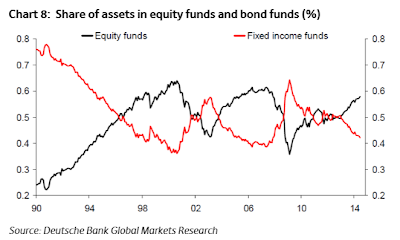 The chart on asset allocations is particularly interesting. Investors are overweight equities just as they were were in 2000 and 2007, and I believe with dire consequences. Jensen says "Statistically, equity markets fall 40-50% (as they did in 2008-09) only a couple of times in a life time, so why somebody is forecasting the next bloodbath to be around the corner is quite frankly beyond me." It seems to me that equities plunged in 2000 and again in 2007. So that was twice in a seven year timespan. Given valuations are equally extreme now, caution is more than in order. Japan prove stocks can stay depressed for decades. And that can happen again, someplace else, besides Japan. I disagree with Jensen on the need for the ECB to do anything about falling prices. For discussion, please see Challenge to Keynesians "Prove Rising Prices Provide an Overall Economic Benefit". Inquiring minds may also wish to consider James Grant Conference Video: Inflation Expectations, Growth, Policy Problems; Europe Has Become Japan.